Kory Stamper grew up in Colorado and graduated from Smith College with a degree in medieval studies. 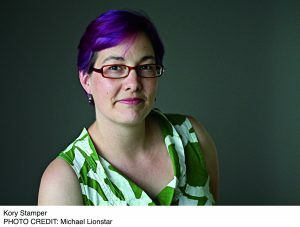 She is a lexicographer who was on staff at Merriam-Webster from 1998 to 2018. 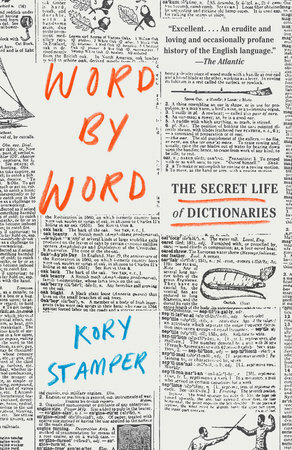 Her debut book Word by Word: The Secret Life of Dictionaries was relased in hardcover in 2017 and is now available in paperback. Kory Stamper has written and appeared in the “Ask the Editor” video series at Merriam-Webster, and she has been a contributor to The Washington Post, The Guardian, and The New York Times. You can find her blog at harmlessdrudgery.com and follow her on Twitter. 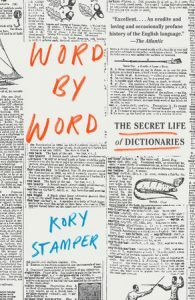 Ed Battistella: I really enjoyed Word By Word, especially the stories of the individual words and description of the process of lexicography itself. It had not occurred to me that there was an extensive training. What was that training like? Kory Stamper: You know that scene at the beginning of Disney’s “Alice in Wonderland” where Alice and her cat Dinah follow the White Rabbit into a hole in a tree trunk, and as Alice says “Curiosity can lead to trouble,” she falls down the rabbithole into Wonderland? And as she tumbles down, she waves goodbye up at Dinah? That’s what training is like mentally, only fewer cats are involved. Essentially, the training you get as a lexicographer is designed to make you unlearn everything you have learned about English. You re-learn grammar, you re-learn what meaning is, you even learn how to read differently. It can be very disorienting, but if you’re the right kind of nerd, also really exciting. You come into this work thinking of language as a fixed, almost inviolate thing, and you quickly discover that it’s a living, moving entity with its own will and history and direction. That’s both freeing and terrifying. EB: Do you remember the first word you got to define? How did that feel? KS: By the time I was actually put to work on a dictionary, I had written so many practice definitions that I don’t remember what the first word I defined was. I do remember that “body English” was in one of those early batches of real defining, and I was pretty pleased with the definition that I had come up with (which currently reads “bodily motions made in a usually unconscious effort to influence the progress of a propelled object (as a ball)”). EB: What’s the toughest word you’ve worked on? KS: “God.” Absolutely, without a doubt. I had to revise the entry for the Unabridged Dictionary, and one of the first things I discovered was that the word “god” was used pretty vaguely in print, which doesn’t give the lexicographer much to work on. So much of the written evidence was stuff like “humanity’s conception of God is inadequate,” which tells me exactly bubkes about what the word “God” means in that sentence. Lexicographers talk a lot about the difference between lexical defining and real defining. Real defining is the attempt to explain the essential nature of a thing—what is truth, what is beauty. Lexical defining is the attempt to explain what the word which signifies a thing means in particular contexts—what does “beauty” mean in the sentence, “That car’s a real beauty.” We do lexical defining and not real defining. But a word like “god” makes that tightrope even thinner and harder to navigate. Can I say that the word “god” means “a being,” or should I use “a deity”? What about “a spirit”? Can I use the word “omnipotent” in the definition which is meant to cover the Abrahamic religious uses of “god,” or should I fudge it because I have just run across a theological debate about whether or not the Abrahamic God is actually omnipotent? Should I capitalize the word? In the end, it took me four months of nonstop work to revise the entry, and while I feel like I did as good as job as anyone who is tasked with defining “god” could do, I’m nonetheless sure that there’s something unintentional in that entry that has condemned me to an unpleasant afterlife destination. Occupational hazard! EB: I was fascinated to many of the backstories of particular bits of lexicography, like the interesting discovery about irregardless. Can you explain that one for our readers? KS: I came into this job knowing, on a molecular level and like everyone else, that “irregardless” wasn’t a word. So imagine my surprise when I discovered that this nonword was entered into dictionaries! As I researched more about how it ended up in our dictionaries, I found that when it first showed up in writing, it was unremarkable—only later was it tarred and feathered as “uneducated” or “illiterate.” That happened during a point in American history when we were giving more lexical weight to the types of English spoken by affluent city dwellers, and we were condemning the types of English spoken by rural communities. “Irregardless” was one of the words that was caught in the crossfire, though there is evidence of its use among highly educated speakers. I actually came to have a deep respect for “irregardless”: here’s a word that everyone despises, that everyone says is illogical or ugly or not a word, that has, in spite of everything, hung out on the periphery of English for more than 200 years. It’s a word that no one will cop to using, but which still has enough written historical and current use to merit entry into a dictionary. I don’t use it myself, but I no longer look askance at people who do. EB: What’s on your radar now, word-wise? EB: How has your work as a lexicographer affected you as a writer? Do you think about using words in novel ways when you write? EB: Do you have any advice for young people trying to break in to lexicography? KS: The field is, honestly, shrinking. We used to have a letter that we’d give to prospective lexicographers that essentially said that getting a job writing dictionaries was a matter of being in the right place at the right time. Now I think it’s a matter of being ahead of the right place and the right time, of really thinking about and pressing into what dictionaries could be instead of what they are. For example, Dictionary.com just added a few emoji to their online dictionary, which I think is brilliant. Emoji can be used lexically, just like words; they have register and different connotations depending on context and even which device you’re using; and people are likely to run across them online, in social media, in texts, on Slack—basically, in the new type of public-private writing that has emerged as more of our lives are lived online. Emoji is one new place that the language has gone that traditional lexicographers have pooh-poohed as faddish or nonlexical. Maybe emoji will fade away—but there are plenty of language trends that the traditional lexicographers of the 1700s and 1800s thought would flourish or fade away that haven’t. EB: I know that from time to time lexicographers are called upon to answer reader mail. What’s the oddest bit of mail you’ve gotten? KS: My favorite bit of weirdness was a poem or freestyle that had nothing to do with words, but was instead about a character named Mr. Baby Burper and his adventures. I don’t remember the whole email, but it definitely had flow: “I’m Mr. Baby Burper, I burp all the babies in the eternity in harmony with all the ladies, I just pat my hand on my leg and say burpady burpady burpady.” It went on from there. It was the most amazing email I had ever read, and it definitely won me some tchotchkes from Marketing back when we had a National Poetry Month celebration. EB: I’ve also really enjoyed the Merriam-Webster “Ask the Editor” videos, which I sometimes play for my students to show them that I’m not making things up. How did that idea come about? KS: Our former Director of Marketing came up with the idea. We already had other formats in which we could share discoveries about words, but they were all written, and she thought that sharing that information via video would be great. I believe that she initially put out a call to all the editors, asking if anyone would be interested, and she got exactly zero replies: you’re asking a bunch of introverts to talk on camera? In the end, she asked three of us that she knew had done publicity for the company, or had outside public speaking experience. Early on, we were just encouraged to share whatever we thought was noteworthy or winsome about the language. Each of us came up with topics that seemed intriguing, or that answered questions that we each had gotten a number of times. The things that people responded to floored us. Who knew that my pasty face and knowledge of 18th-century grammatical movements would launch a resurgence in the use of the plural “octopodes”? I sure didn’t. KS: I am! I’m writing a nonfiction book about the historical quest to define color. It touches on art and war and secret identities and dictionaries, and in the process of writing and researching it, I’ve turned back into that sugared-up toddler: lookit! Lookit! This is amazing! KS: Thanks so much for asking!